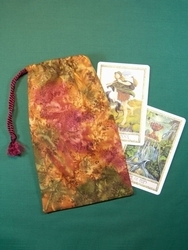 Wide Tarot Bags - Copper Age Wide Tarot Bag - Tarot Bags, Tarot Cards, Cloths, & More! 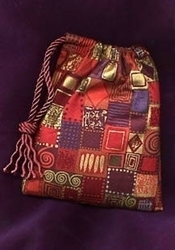 Colors of copper, rust, orange, tangerine, wheat, brown, and dusty grape sculpt interesting patterns into the shapes of spirals, triangles, dashes, and wavy lines on the fabric. 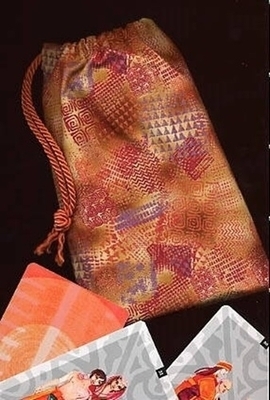 The copper is metallic and adds a special luxurious look to the entire bag. 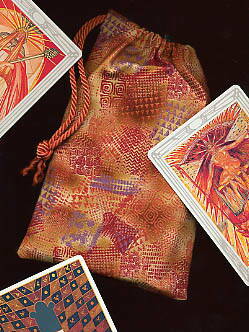 Many decks of oracle or tarot cards have colors or patterns that are complemented by this attractive bag. 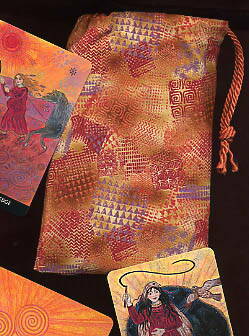 Some such pairing are shown here in the pictures and include cards from the following decks: Osho Transformation Tarot (product image, right), Crowley Thoth Tarot (below left), and Celtic Wisdom Tarot (below right). 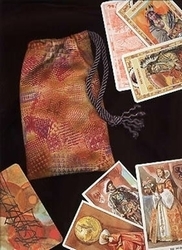 Other attractive coordinations with card illustrations are found in the following decks: Haindl Tarot, One World Tarot, Voyager Tarot, Karma Tarot, Golden Dawn Tarot, New Century Tarot. Size: Wide. 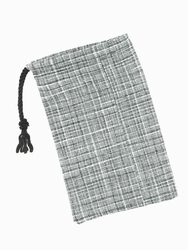 The orange cord shown in the picture is no longer available. Please select a different color.